Together, let’s storm Capitol Hill to promote and protect your right to own, operate and grow your business! One of the most effective ways for NFIB to educate Members of Congress on key issues is to let them hear directly from the small business owners they represent. During last year’s Fly-In, NFIB members urged Members of Congress and their staff to make small business expensing permanent. A few months later, it became law! This is proof your voice will make a real difference, and that Congress is listening. Regulations will be the focus of this year’s Fly-In, specifically: Midnight regulations, the new Overtime rule, and penalties in the Affordable Care Act. Learn more about these issues by watching the below video, and reading the Fly-In Issues Sheet. NOTE: Hill meetings are in the process of being scheduled by Caitlin Lanzara who will be in contact with NFIB members about their meetings. *The hotel requires guests checking-in submit a valid credit card for any incidentals. If you requested a room with a double-bed, please confirm with the hotel upon check-in. NFIB registration table is open June 21 and June 22 from 11:00 AM – 4:00 PM, located one level down from the main lobby. Yes. There is a flat rate of $55 per person attending the event. Will I need transportation once in DC? No. NFIB will coordinate transportation between events within the city. How do I get to DC? There are two local airports: Ronald Reagan Washington National Airport (DCA) and Washington Dulles International Airport (IAD). DCA is closest to the event, downtown DC attractions, metro accessible, and roughly a $20-$25 cab ride to the hotel. IAD is roughly a $65-85 cab ride, depending on traffic. Transportation Resources: SuperShuttle, Dulles Flyer, taxi fare estimator, metro / trip planner, hotel has parking. If I’m planning a vacation around this trip, what should I see while in DC? For recommendations on things to see and do during your visit, checkout our DC Visitor’s Guide. For general event questions, contact your NFIB’s Grassroots Team at [email protected] or call Jessica at (202) 314-2003. For questions about NFIB’s Leadership Trust contact [email protected] or call Kathleen at (202) 314-2011. For questions about your meetings with Members of Congress and their staff, contact Caitlin at [email protected] or call (202) 314-2076. Can I post photos of the event on social media? Yes! Feel free to take photos and videos throughout the event to document your Fly-In experience, and post them on your Facebook or Twitter profiles. Be sure to include the event hashtag, #SmallBizVoice and @NFIB in your posts. Additionally, be sure you follow NFIB on Facebook and Twitter, and engage with us throughout the event. Get a free ride and support an NFIB member! Need a ride from the airport to the hotel and want to skip the taxi line? 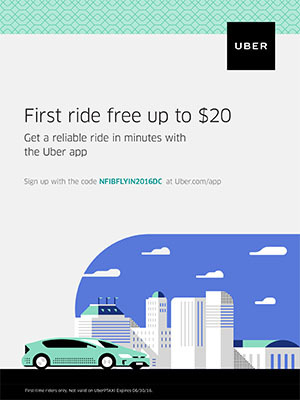 New users to Uber can download the app from their iPhone App Store or Android Google Play and enter the code NFIBFLYIN2016DC or download the coupon to save $20 off their first ride. The code is valid in the DC area June 20 – June 30 for first time Uber users.